Nothing to indicate Anne was less attractive then Elizabeth, Anne was called "Beauteous" and she is described as being of similar appearance to Elizabeth. And their is no rumor Richard cheated on her, that didn't start until Alice Weir made it up in the 90s. The rumor (Which has proven to be false) was the Richard wanted to marry her for CLAIM to the throne. That was always the rumor. It is ridiculous to call Queen Anne "ineffectual" because she isn't infamous. Richard did not usurp the throne meaning "to take by force" he claimed it at the behest of the three estates of the realm. Read John Ashdown Hill's book "Eleanor the Secret Queen" Edward the fourth made a bigamous marriage. That is now an established fact. The boys were illegitimate. Note: Henry Tudor is the usuper. He took the throne by force of arms. Please refrain from using an aggressive tone on my blog, or I'll ask you to leave. Now, in relation to your post: I have read Josh Ashdown-Hill's book about Eleanor Talbot, so I'm not quite sure why you're instructing me to read it when I already have. It is disputed whether or not Edward IV committed bigamy, because it is uncertain whether he was truly married to Eleanor before his marriage to Elizabeth Wydeville. I would also like to point out to you that there is no evidence of rumours from Edward's own lifetime that his marriage to Elizabeth was invalid. It was only in the wake of his death and the succession of his son, Edward V, that "evidence" emerged to suggest that his marriage to the queen was invalid and his children were illegitimate. By that point, Eleanor was conveniently dead and so could not testify to the truth of the matter. You are wrong to claim that Edward's bigamous marriage "is now an established fact" when, in fact, it is nothing of the kind. The charge against the dead king was based on rumour and speculation. He was not alive to answer the charge. Perhaps you would be interested in reading my book, "Queenship in England 1308-1485", in which I examine Anne Neville's tenure as queen consort. Compared to her predecessors Margaret of Anjou and Elizabeth Wydeville, Anne was ineffectual. There is no evidence of effective household management, intercession, patronage or diplomatic activity. Her contemporaries blamed her for the death of her son in 1484, because women were customarily faulted for the loss of heirs at that point in time. Henry Tudor might be a usurper, but that does not prevent Richard III from also being a usurper. The evidence that Edward V was illegitimate is shaky. In his father's lifetime, the prince's parentage was not questioned, nor was the validity of his parents' marriage. His marriage was indeed questioned by two people the Earl.of Desmond and George Clarence. Both executed. No one from then on would utter a word until Edward was dead. Who blamed Anne Neville for the death of her son? She could have gotten the flu got pneumonia and died if it. .
That is not "ineffectual" It connotes an intelligent and able woman Richard trusted. Where is your evidence that Richard appointed Anne as his regent? Only kings and male royalty were able to appoint their wives as regents - Henry VIII, for example, appointed both Katherine of Aragon and Katherine Parr as regent. Before he became king, Richard would not have been able to appoint his wife as regent. 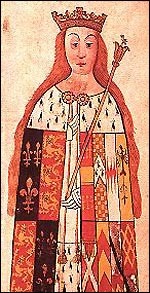 Several historians have speculated that Anne Neville may have suffered from ill health during her comparatively short life. Maybe you would like to read my book, which actually discusses Anne Neville's queenship, rather than posting inflammatory comments on my blog.